Protoceratops, the Late Cretaceous horned dinosaur widely suggested as being the inspiration for the griffin myth. This image shows the lesser seen P. hellenikorhinus, a larger, more ornamented species of Protoceratops than the familiar P. andrewsi. One thing that everyone knows about the mid-sized, Late Cretaceous Asian horned dinosaur Protoceratops is that it's thought to be a fossil with historic, mythological significance. Specifically, it's said to be the origin for the griffin, the lion-bodied, bird-headed chimera that has appeared in art and folklore for thousands of years. You could be forgiven for thinking that this idea is quite old and established because it's mentioned frequently in books, TV shows, and online articles, but it's actually a relatively modern invention. What I'll be calling the 'Protoceratops-griffin hypothesis' was first proposed by Adrienne Mayor and Michael Heaney in the 1993 Folklore paper "Griffins and Arimaspeans" and then developed by Mayor across two editions of the book The First Fossil Hunters: Paleontology in Greek and Roman Times (2001, 2011). These authors were not the first to suggest that the griffin had a basis in ancient interpretations of fossil animals (Mayor and Heaney 1993), but they presented the first argument linking griffins to horned dinosaurs as well as a suite of historic evidence supporting their interpretation. 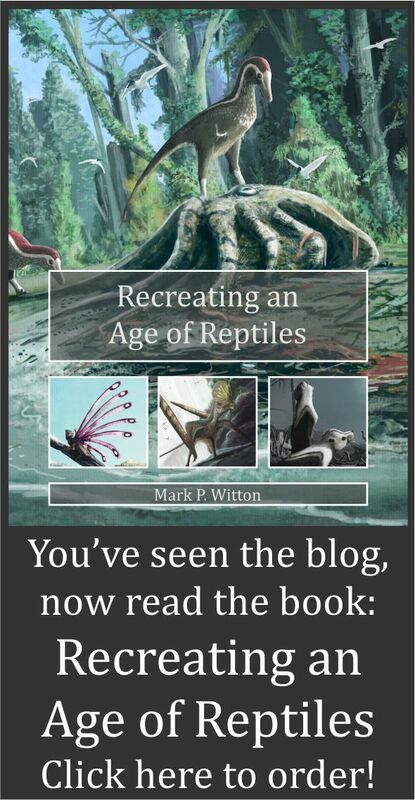 The idea has been praised by several palaeontologists and is celebrated as one of the superior accounts of fossils influencing ancient mythology. Bird-griffin statue, 7th century BCE. Was Protoceratops the inspiration for this creation? From Mayor and Heaney (1993). The basic premise of the Protoceratops-griffin hypothesis is straightforward. Tales of Ancient Greek explorers of the 7th century BCE (but first written about in the fifth century BCE) include discussion of vicious, beaked, gold-guarding quadrupedal animals living in deserts to the northeast of Greece. These stories are said to have originated with the Scythians, nomadic peoples who mined gold from central Asia from localities close to the bonebeds of Protoceratops in Mongolia and China. It is reasoned that Scythian nomads saw the weathering skeletons of Protoceratops as they prospected for gold and told others of their existence. The Greeks interpreted these as real-life versions of the griffins they knew from history and the mythology as we know it was born. The hypothesis argues that specific aspects of griffin anatomy were based directly on these accounts of Protoceratops: the beaked jaws and quadrupedality are obvious, but griffin wings are argued to be Protoceratops neck frills or shoulder blades, taloned hands are thought to reflect Protoceratops claws and so on. As the Greeks continued to hear about these animals, eventually from direct trade with the Scythians in the 7th century BCE, their interest in griffins grew so that they became familiar components of Greek culture. For hundreds of years Greek scholars and artists would continue adding to griffin lore, always referencing the same touchstones of desert settings, powerful, beaked quadrupedal animals, and gold guarding. Their depictions and stories would be passed through to medieval times and, ultimately, the modern day. I recently became genuinely interested in this interpretation as part of research into the earliest accounts of palaeoart. If griffin art is indeed of horned dinosaur origin, it might qualify as some of the oldest on record. But reading about the Protoceratops-griffin hypothesis (in Mayor and Heaney 1993; Mayer 2011) did not deliver the proverbial 'nugget of truth' behind the griffin myth I expected based on its fame. My impression was that evidence cited for this hypothesis was generalised to account for as much griffin lore as possible, that several major, obvious questions remained unanswered, and that there was not any attempt to refute other, non-fossiliferous takes on griffin origins. Digging into the primary literature on griffin iconography seemed to confirm my concerns, suggesting that the Protoceratops-griffin hypothesis is unfavourable among archaeologists (e.g. Frankfort 1937; Goldman 1960; Wyatt 2009; Tartaron 2014). Moreover, there are far more parsimonious and well substantiated takes on these creatures which do not rely on fossil data. In the interests of providing a counter-argument to all the 'pro'-Protoceratops-griffin hypothesis media out there, I'm sharing the products of my research here. Perhaps the largest issue with the Protoceratops-griffin hypothesis is the fact it largely ignores griffin lore before the 7th century BCE. 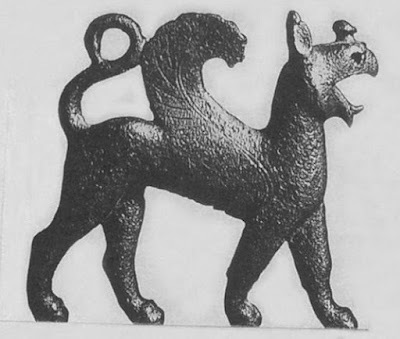 Griffin iconography extends deep into human history with one of their best early appearances dating to 4th millennium BCE Susa - an ancient city in what is now Iran (below, Frankfort 1937). Similarly aged or older artefacts from Egypt also show griffin-like forms (Wyatt 2009), and by the 3rd millennium BCE griffins were a regular component of art in many Near Eastern countries. The role of griffins in these communities remains a matter of controversy because we have little or no written explanation of their significance. Nevertheless, they are abundant enough to suggest some importance in these cultures, and modern scholars have attempted to interpret griffin imagery based on religious and cultural practises of these times (e.g. Wyatt 2009). 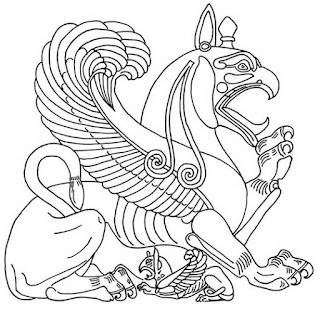 Line drawing of perhaps the oldest known image of a griffin, from Susa, 4th millennium BCE. From Frankfort (1937). As noted above, the Protoceratops-griffin hypothesis relies on Greek and central Asian evidence no older than the seventh century BCE, picking up the griffin story thousands of years after it begins in the Near East. How does it account for this older period of griffin history? Mayor and Heaney (1993) simply write "...we have no way of knowing what kind of folklore, if any, was attached to these creatures" (p. 41), and a similarly brief discussion is presented by Mayor (2011). What we need to valiate the Protoceratops-griffin hypothesis is a link between Protoceratops and the oldest Near Eastern griffin art, especially if these fossils were meant to have directly inspired griffin appearance. To my knowledge, no such link has been presented, and this is a problem: whether we understand them fully or not, these early griffins still provide basic information on where and when griffins entered ancient cultures, and they must therefore be the focus of any attempt to explain griffin origins. As it is, the fact that Near Eastern griffins substantially pre-date any from central Asia is a clear argument against the Protoceratops-griffin hypothesis. Taking this point further, overlooking the early history of griffin art also means that the Protoceratops-griffin hypothesis does not engage with current, mainstream interpretations of the spread of griffin culture to Ancient Greece. Griffins are thought to have become popular in Greece during the 'Orientalizing Period', a cultural event occurring around the 7th century BCE when Greek art, technology and literature became heavily influenced by Near Eastern civilisations (Tartaron 2014). Put simply, the uptake of griffins into Greek culture coincides exactly with their sudden interest in the guys who'd been drawing and sculpting griffins for thousands of years. It's easy to understand why this is the preferred explanation for the rise of Grecian interest in griffin imagery. It involves the civilisations known to have depicted these animals before anyone else, fits the dates attributed to Greek and Near Eastern griffin art perfectly, and is easily explained as part of a well-established period of cultural exchange between these peoples. To accept the Protoceratops-griffin hypothesis we need to explain why it better accounts for griffin history than the consensus view. The lack of attempt to do this by proponents of the Protoceratops-griffin link is a weakness in their argument. The Protoceratops-griffin hypothesis also presents a simplified interpretation of griffin iconography. Numerous variants on griffins are found in the ancient world, reflecting differences in anatomy, pose and behaviour. The 'bird-griffin' - the winged lion with an avian head (see images, above and below)- is the type Protoceratops is thought to have inspired, but is just one of many griffin chimeras identified by researchers. Reflecting taxonomy on real animals, the identification of distinctive griffin 'species' varies between researchers, but they are generally thought to include wingless sphinxes (human head on a recumbent lion), bipedally standing winged lions with human heads, winged humans with avian heads, winged lions, long necked 'lion-griffins' (sometimes called 'lion-dragons'), and lions with avian heads, wings and forelimbs (Frankfort 1937; Goldman 1960; Wyatt 2009; Gane 2012). Within these forms are more variation: they may or may not include wings, tails, ears, 'crests' or horns on the snout, manes of hair or feathers, and teeth, as well as differences in neck length, mouth gape and claw size. The animal species used in these chimeras differ too. For instance, there are bird-griffins with eagle, peafowl and falcon heads, as well as a variety of big cat species reflected in their bodies and limbs. Tails may be of either avian or felid identity. A selection of griffins forms from Goldman (1960). Note variation in tails, faces, neck length and ears. Both Mayor and Heaney (1993) and Mayor (2011) use different griffin types from a variety of cultures in their argument for the Protoceratops-griffin hypothesis, including wingless forms, lion-griffins/dragons, 'classic' bird griffins, as well as toothed and long necked variants. It's argued that these can be distilled to common elements reminiscent of Protoceratops in size and form despite their (sometimes major) anatomical differences, and that this implies a common origin. Variable interpretation of broken fossils are said to explain features which differ from genuine Protoceratops anatomy. For instance, the horns and ears of some griffins might reflect misinterpreted broken skulls and neck frills, and wings could be damaged frills or misidentified shoulder blades. Embellishment of stories passed on from distant lands might explain other variations. This homogeneous treatment of griffin imagery is troublesome for two reasons. Firstly, the disregarding of griffin form shows a selective approach to evidence gathering, cherry picking elements that suit the Protoceratops origin while ignoring those which are problematic. The fact is most griffin artworks do not look like Protoceratops beyond the superficial similarity of being beaked quadrupeds (see below). Furthermore, griffin art remains differentiated even after Greek and Scythian cultures were known to have been communicative and - theoretically - Protoceratops begin could influence griffin depictions. If there was a solid, real-world basis for griffins once the Greeks and Scythians began talking, why didn't griffin appearance crystalise into something more definitively Protoceratops-like? Homogenising griffin forms also contradicts modern interpretations of griffin art. 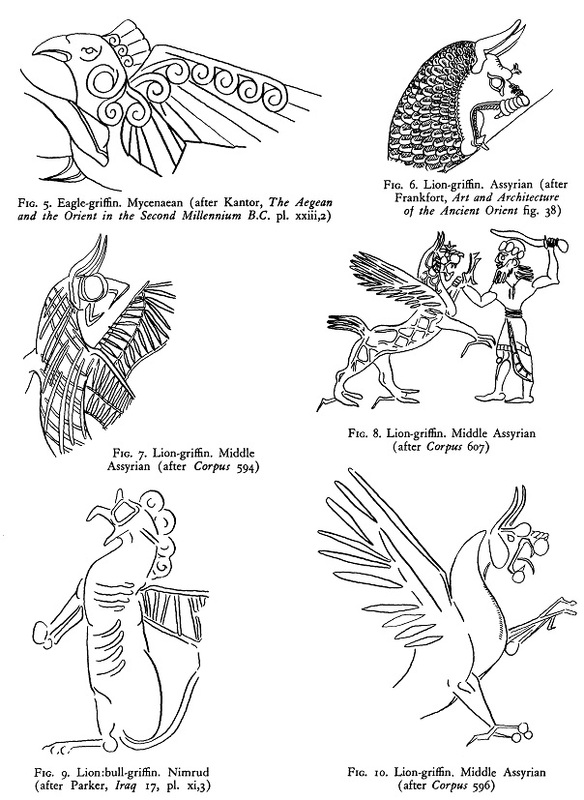 Many researchers stress the unique histories, origins and cultural significance of different griffin forms, and some even directly caution about treating these chimeras as interchangeable for fear of obscuring their true meaning and history (e.g. Goldman 1960; Wyatt 2009; Gane 2012). Most scholars simply see griffins as chimeras - creatures invented from components of animals and human individuals for symbolic or literary intent (Wyatt 2009; Gane 2012). It's assumed that differences between griffins reflects efforts to convey information about these creatures or the scenarios they were depicted in. For example, the addition of wings may indicate swiftness or divinity; large, erect ears might suggest alertness; claws imply ferocity, and so on. Studies show that these features were not added randomly to griffin art, and the development of distinctive griffin types can be traced over time (e.g. Goldman 1960). The message from mainstream archaeology seems to be that griffin iconography had complex origins and development within the framework of chimera creation common to ancient cultures, and that generalising their form is probably not the best way to understand them. Superficial musculature of a lion, illustrated in Goldfinger 2004. The torsos and limbs of detailed griffin art shows the same characteristic muscle groups, specific anatomies and proportions as these cats, suggesting they are not generic quadrupeds but true chimeras of large felids and birds. This muscle plan can easily be seen in some of the imagery posted below and above. But is it correct to interpret the griffin as a traditional chimera of familiar extant animals or do we need the exotic, extinct form of a Protoceratops to explain their anatomy? I'm not going to compare this dinosaur with all variants on griffin composition here, but will suggest that the 'classic' bird-griffin does not need Protoceratops. To the contrary, it's obviously composed of a bird head mounted on a lion torso, limbs and tail, and topped off with bird wings mounted on the shoulders. There are no especially weird or exotic anatomies that cannot be explained without reference to modern species, and even the oldest renditions of griffins show closely observed details of lion and bird anatomy that leave little doubt as to their source. This is particularly true for the lion elements, where the forefeet often have lion-like thumbs, and large, padded, clawed digits. When griffin tails are not just clumps of feathers, they are long, slender and curve upwards in a very lion-like fashion, and their necks are often adorned with manes. I'm struck at how lion-like the proportions and musculature of the torso and limbs are in most griffin depictions: they are not just generic quadrupeds, but really obviously and specifically referencing big cats (above). Sketch of a juvenile Protoceratops andrewsi skull, right lateral view. We can also observe that, on the whole, griffin anatomy often strongly contrasts with the anatomy of Protoceratops. I don't want to set up a straw man here - after all, it's likely we know far more about Protoceratops than anyone who lived thousands of years ago, and the hypothetical passing of tales about Protoceratops from central Asia to eastern Europe is an incredibly long game of Chinese whispers. However, if the Protoceratops-griffin hypothesis is to be accepted it needs to pass some basic anatomical tests. Let's start with the head. It's immediately obvious that there is nothing projecting rearwards from the posterior head region of most griffins, whereas all Protoceratops (even very small juveniles) have some sort of frill extending posterodorsally from the back of the skull (above). The ears and crests of griffins, explained as being the broken frills of Protoceratops fossils, are structures which project upwards from the head, not backwards. If we must give these structures a basis in reality, we can look to the ornamental head feathers of birds for the crests (remember that the heads of some elaborate birds, like peacocks, are used in some griffin art) and any number of common mammal species for the ears. These are surely simpler alternatives than the broken skull bones of dinosaur fossils occurring thousands of miles away from the source of griffin origins. It is often suggested that griffin wings might be mistaken interpretations of the Protoceratops frill, but the wings are clearly set on the shoulders in most griffin art, often behind lion-like neck manes. Moreover, as noted above, not all griffins have wings - how do these versions account for the Protoceratops frill? Protoceratops is also not toothless, its densely packed cheek teeth being obvious in even weathered skulls. The majority of griffin images show a fully toothless beak far more like that of a bird than a ceratopsian dinosaur. Scott Hartmans's skeletal reconstruction of Protoceratops andrewsi. Borrowed from the excellent Scott Hartman's Skeletal Drawing.com. Protoceratops also does not have lion-like hands or feet, nor any raptorial claws (above). Ceratopsians had relatively stout, blunt claws, and the hands of early taxa like Protoceratops are not especially big. I'm not sure anyone - even folks living thousands of years ago - has ever looked at Protoceratops and been amazed by its powerful limbs or ferocious talons, whereas these are striking characteristics of big cats. Finally, the tail of Protoceratops is proportionally deep, seemingly incapable of significant dorsal curvature, and not at all like that of a lion. So beyond being beaked animals with four legs, there's no striking similarity between Protoceratops and bird-griffins. Once we start considering the variance in griffin art - the long necks, manes, feathers and so forth - even more differences become apparent. In light of this, and the fact that living animal anatomies can easily account for all elements of ancient griffin depictions, there seems no need to invoke Protoceratops as a part of griffin anatomy. The mainstream view of griffins being simple chimeras of living animals has to be considered a far simpler, and thus more likely, interpretation of their form. Even if Protoceratops did not inform the raw appearance of griffins, could it be referenced in written accounts of griffin appearance and behaviour, such as their desert-living, parental care and gold-guarding habits? It's perhaps these accounts which provide the best evidence for the Protoceratops-griffin hypothesis as they imply the gold-strewn deserts of central Asia as the griffin's home. It's worth summarising some details of the first griffin accounts here as their nature and propagation is important. Please check out Phillips (1955), Bowra (1956), Mayor and Heaney (1993) and Mayor (2011) for more details. Much of Greek griffin lore is derived from stories of the Greek poet Aristeas, who travelled through Asia in c. 675 BCE. His adventures and travels are first recorded in texts from 460-450 BCE (Mayor and Heaney 1993) and were so influential that they continued to be referenced well into the Common Era. However, it's worth stressing that these stories are semi-mythical tales of a semi-mythical man: Aristeas was a real person, but he is described as seeing and doing things which are combinations of real and fantastic phenomena. 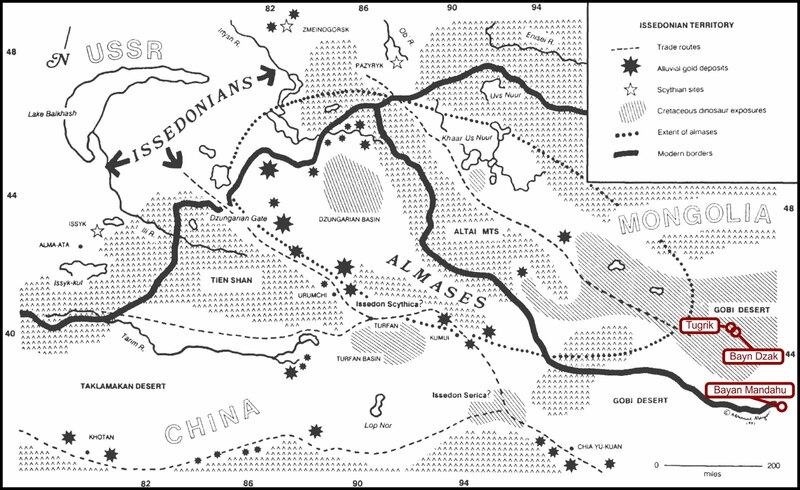 Scholars still debate the realities behind the locations, events, creatures, and peoples Aristeas encountered, and even ancient Greek authors, such as Herodotus, did not believe everything Aristeas was said to have seen and done (Phillips 1955, Bowra 1956). Among the earliest accounts of Aristeas' travels is the tragedy Prometheus Bound, a tale involving gods, titans, gorgons and other monsters. Here, griffins and other creatures were suggested to live to the far north-east of Greece in a desolate desert setting where nomadic barbarians (the Scythians) also hunted for gold. Other documents from the fifth century BCE, also influenced by tales of Aristeas, tell of griffins guarding the gold sought by men and other beasts. Griffin burrows were mentioned by Pliny the Elder's Naturalis Historia, written in 77 CE, as well as by Pausanias in 170 CE. These authors, again citing Aristeas, described how griffins were engaged in a constant war with a race of one-eyed men, the Arimaspi (Bowra 1956). Later accounts, penned in 200 CE, provide specifics of griffin anatomy and behaviour. They include the familiar accounts of their far eastern habitation of mountains and deserts, as well as new information: their membranous wings (considered useless for flight), the extent of their feathering, the colouration of different body parts, the fiery look in their eyes, the fact that men cannot best adult individuals but can capture their offspring, their nesting behaviour and parental nature, and how miners prospect for gold at night to avoid upsetting them. 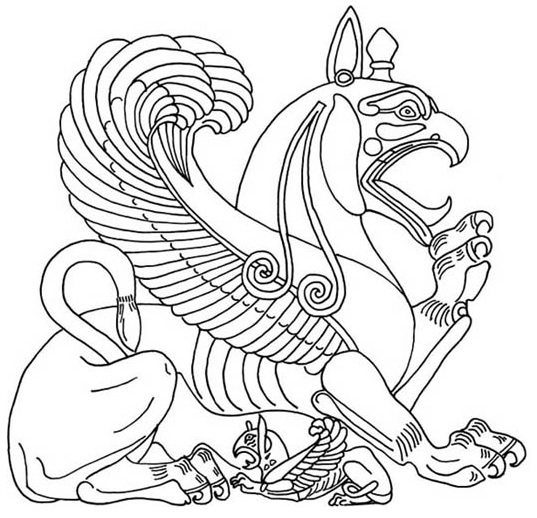 Line drawing of a bird-griffin with offspring from Mayor (2011). The original hammered bronze relief dates to 7th Century BCE, Greece. Note the extremely lion-like torso, including strands of hair dangling from the mane. The original has texturing around the neck to further demonstrate the presence of long, shaggy hair. These stories are the start of griffin lore as we know it today thanks to medieval scholars carrying these basic elements into later versions of griffin legends. But do these stories strengthen the idea that Protoceratops is the 'real' griffin? Again, there are problems. For starters, the major early accounts of griffins are - at best - semi-mythical stories containing numerous imagined beasts and supernatural phenomena. Why we should consider griffins to have any more basis in reality than the gods, monsters or strange human races also mentioned in these stories? If griffins are based on actual phenomena, do we need to seek rationales for these other creatures, too? Secondly, these texts echo griffin art in providing no anatomical details specifically reminiscent of Protoceratops. Indeed, many of their embellishments (feathers, colours, wing membranes etc.) are clearly not based on anything to do with horned dinosaur fossils. These accounts also blatantly refer to living animals, not fossil or skeletonised ones, and their descriptions of griffin wars with one eyed men, the vulnerability of their offspring to human capture and so on fit better with fantastical yarns than accounts of fossil creatures. Mayor (2011) suggests that the some griffin behaviour identified in these texts supports Protoceratops as the griffin source, such as their parenting skills (see image, above). These might marry up nicely with the well-known occurrence of nests and juvenile Protoceratops alongside older individuals, but parental care is easily observable for many animals, including the mammals and birds that comprise the griffin chimera. There is no need to invoke a 'third party' fossil species to explain this behaviour in griffins when thousands of modern species could have provided the same inspiration. 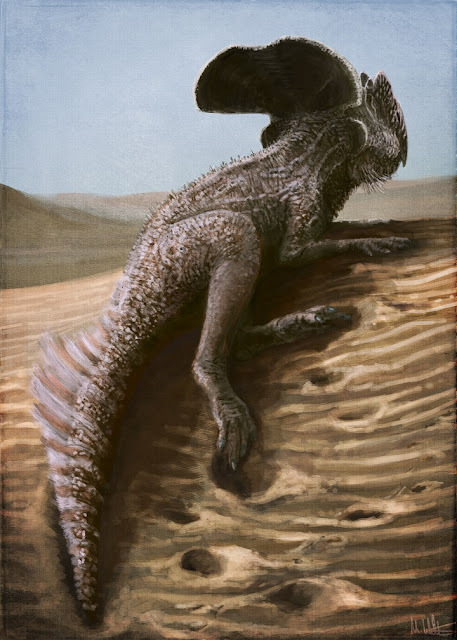 This trait is just not specific enough to implicate Protoceratops as being referenced in griffin lore, not to mention that there's no evidence whatsoever of ancient peoples discovering dinosaur eggs or nests. Protoceratops localities (red) superimposed onto the map of ancient central Asian trade routes and alluvial gold sites presented in Mayor and Haeney (1993). Note the scale bar, bottom right, which represents 200 miles, and the distance between Protoceratops sites and gold deposits (black stars). Protoceratops locality information from Fastovsky et al. (1997) and Lambert et al. (2001). What of the gold guarding, behaviour, though? This is a specific trait that cannot be casually dismissed for being common among living animals. Mayor and Heaney (1993) and Mayor (2011) identify a wealth of alluvial gold deposits that may well be the real inspirations of the gold described in griffin tales and found that some ancient trade routes do bisect central Asian Cretaceous dinosaur beds (see map, above). An argument for Scythian people encountering Protoceratops is starting to look compelling, but, again, closer scrutiny reveals complications. 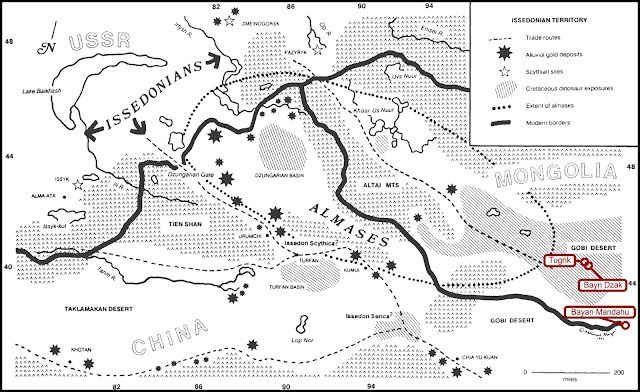 Mayor and Heaney (1993) and Mayor (2011) show maps with Cretaceous fossil sites right the way across central Asia, giving the impression that Scythian miners and traders were falling over fossils wherever they went. But we're not just after any old Cretaceous fossils: we're specifically after Protoceratops. Both species of this dinosaur only occur in a few select localities in the southernmost region of Mongolia and adjacent to the China/Mongolia border (Fastovsky et al. 1997; Lambert et al. 2001). Those ancient trade routes and mining sites need to approach these specific sites if we're to bring Protoceratops into this story. Comparing modern Protoceratops localities with the maps in Mayor and Heaney (1993) and Mayor (2011) shows that these dinosaurs occur several hundred kilometres east from the nearest alluvial gold deposits, and even further away from the most productive regions (above). The identified ancient gold sites are mostly west or southwest of the Altai Mountains, suggesting ancient folks would only encounter Protoceratops fossils if they travelled hundreds of kilometres away from the core mining sites. This also present a further complication to the Protoceratops-griffin hypothesis: are Protoceratops localities likely to contain gold when they're so far away from the alluvial gold sites? Both Mayor and Heaney (1993) and Mayor (2011) argue that desert storms may have transported nuggets of gold to Protoceratops localities, and that seeing these transported nuggets alongside Protoceratops fossils may account for the gold-guarding element of the griffin mythos. This is something we can test because the geology of Protoceratops sites is well documented and understood. Assuming the same basic meteorological processes occur today as thousands of years ago, we should see evidence of windswept gold in the Protoceratops bonebeds. But as far as I'm aware, no gold has been reported from these sites, either as surface debris or as buried elements. Moreover, although the possibility of wind transportation is not excluded entirely, no gold is mentioned by the palaeontologists with Mongolian field experience interviewed by Mayor and Heaney (1993) or Mayor (2011). All this considered, the link between Protoceratops and gold deposits is not compelling. Finally, it's worth noting that the Greek accounts of griffins may no longer be the only texts on these creatures from the first century BCE. Gane (2012) discusses Babylonian and Neo-Assyrian literature which is tentatively thought to describe another take on griffin lore. This provides a very different interpretation of griffins as divine guardians against evil spirits, possibly associated with funerary rites. This sounds little like the idea that they were desert-dwelling, gold-hoarding wild animals, and of course suggests no obvious link to fossil animals of China and Mongolia. If correct, this find shows that our Greek legends are only one set of griffin lore: they are more familiar to us because of their retention in the post-classical period, but they might not be the only, or even the original interpretation of these creatures. Thus, even if Protoceratops is something to do with the griffin - which is far from a done deal - it is likely only involved in one component of griffin folklore. This seems to echo points made above about the griffin as a very old and complex concept, and how interpretations of its origins are blurred by multiculturalism. So... is Protoceratops the basis of the griffin myth? Near Eastern griffin culture seems to occur thousands of years before we have evidence for it in central Asia, suggesting Protoceratops anatomy could not be referenced in any way in the conception of the original griffin. Griffin anatomies, in all their variants, are entirely and best explained as chimeras of extant animals. There is no need to invoke any exotic fossil anatomies in their design. Griffin iconography, and perhaps written legends, are sufficiently varied to suggest a complex set of origins and legends for these creatures. Ancient Greek writings seem to lack compelling references to Protoceratops, and the aspects of appearance and behaviour they discuss clearly indicate they were not informed by fossilised animals. Several details of these accounts suggest they must be talking about imaginary creatures. Protoceratops fossils are found hundreds of kilometres from ancient Scythian gold mines, undermining the suggestion they might be the source of griffin gold guarding lore. There is no indication - historic or geological - that fossils of this dinosaur species have ever been associated with gold. With all this said, it seems invoking Protoceratops to the griffin myth is nothing but a complication for griffin origins. Data has to be selected to fit this model and then worked around, rather than with, existing ideas on griffin origins that better account for its history, cultural diversity and spread among ancient peoples. So, no, I can't see any reason to think Protoceratops has anything to do with griffin lore, and entirely understand the mainstream view of it as a chimeric animal cooked up by ancient cultures of the Near East. Interestingly, none of the recent papers on griffin lore and imagery I looked at in preparation for this article mention the Protoceratops-griffin hypothesis, and it's surprisingly challenging to find much mention of it in any peer-reviewed literature. This is despite its 23 year vintage and wide popularity among educators, media outlets and some palaeontologists. It clearly has not been adopted as readily by archaeologists as by those of us interested in dinosaur science. I suspect this idea has found greater mileage among the palaeontologically minded because it presents an interesting and seemingly reasonable story, but it also straddles disciplines and knowledge bases to discourage further research from people mainly interested in extinct animals. Given the lack of commentary on this idea from archaeological quarters, I'm curious to know what folks with a greater understanding of ancient cultures and histoy make of this idea. The artwork and words you see here are supported by folks who back me on Patreon, the service which allows you to directly support artists and authors with monthly payments. This long, detailed article is exactly the sort of thing I can produce because of this support. If you enjoyed it and would like to see more, you can back my blog from $1 a month. In exchange, you get access to bonus art, discussion and rewards - the more you pledge, you more bonuses you receive! For this post, my patrons were privy to in-progress versions of the painting at the top of the article, discussions of Protoceratops anatomy, and narrowly avoided lots of swearing about rendering of complicated frill geometry. As usual, thanks to everyone who already supports me! Bowra, C. M. (1956). A Fragment of the Arimaspea. The Classical Quarterly, 6(1/2), 1-10. Fastovsky, D. E., Badamgarav, D., Ishimoto, H., Watabe, M., & Weishampel, D. B. (1997). The paleoenvironments of Tugrikin-Shireh (Gobi Desert, Mongolia) and aspects of the taphonomy and paleoecology of Protoceratops (Dinosauria: Ornithishichia). Palaios, 59-70. Frankfort, H. (1937). Notes on the Cretan griffin. The Annual of the British School at Athens, 37, 106-122. Gane, C. E. (2012). Composite Beings in Neo-Babylonian Art (Doctoral dissertation, University of California, Berkeley). Goldfinger, E. (2004). 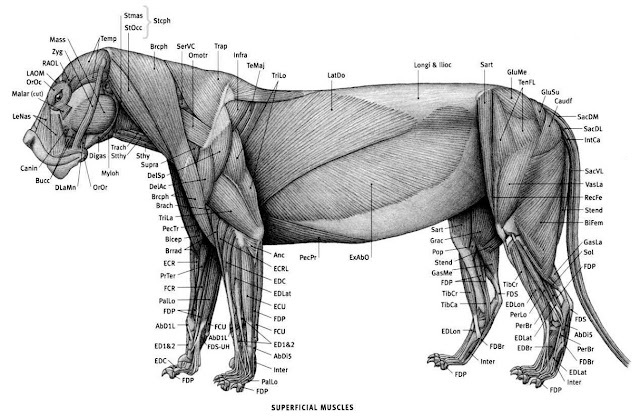 Animal Anatomy for Artists: The Elements of Form: The Elements of Form. Oxford University Press, USA. Goldman, B. (1960). The development of the lion-griffin. American Journal of Archaeology, 64(4), 319-328. Lambert, O., Godefroit, P., Li, H., Shang, C. Y., & Dong, Z. M. (2001). A new species of Protoceratops (Dinosauria, Neoceratopsia) from the Late Cretaceous of Inner Mongolia (PR China). Bulletin-Institut royal des sciences naturelles de Belgique. Sciences de la Terre, 71, 5-28. Mayor, A., & Heaney, M. (1993). Griffins and Arimaspeans. Folklore, 104(1-2), 40-66. Phillips, E. D. (1955). The legend of Aristeas: fact and fancy in early Greek notions of East Russia, Siberia, and Inner Asia. Artibus Asiae, 18(2), 161-177. Tartaron, T. F. (2014). Cross-Cultural Interaction in the Greek World: Culture Contact Issues and Theories. In Encyclopedia of Global Archaeology (pp. 1804-1821). Springer New York. Wyatt, N. (2009). Grasping the Griffin: Identifying and Characterizing the Griffin in Egyptian and West Semitic Tradition. Journal of Ancient Egyptian Interconnections, 1(1), 29-39. A simpler solution: people prospecting for gold don't like to share their gold lode. In a time where people basically believe anything their are told, what's simpler than providing a Griffith that, conveniently, guards gold rich areas? My one beef with the argument is that it is not that people presume that the origin of the Grecian concept of "griffin" is Protoceratops, but that they use Protoceratops as if it, and only it, were such an inspiration. It need not even be that people are overly picky about what specifically about that taxon they use to compare supposed and rather varying winged monsters from Mesopotamian, Sumerian, Assyrian, Grecian, and lastly Roman folk-monsters; but that they use these animals in particular. Protoceratops as a concept did not exist at the earliest until at least the 1700s, with Linnaeus, which allowed the taxon to be identified as such. Picking apart that animal as being a poor representative is all nice, but it elides the real problem: The griffin story comes from somewhere, and it may come from many somewheres prior to the Greek adoption of their mythic figure. Just as there is no one true Dragon origin (crocodilian, rhino, whatever), there may be no one true Griffin origin; and there may be a ceratopsian from the middle and far eastern Asia at its root. Chinese and Japanese iconography is almost as old as Aboriginal Australian iconography, and seem to sometimes depict animals that aren't, but may have been, which may support these ideals. Somewhat less troubling is the absence of a clean alternative to where the Griffin comes from. Since it does not start with the Greeks (how could it?) whom does it start with, and from what? What other candidate concepts lead us to "griffin" and in what way? Perhaps instead of starting with something bird-like, you should look at the more common lion-like monsters. It matters not how they get into their mythological roles, though; as Gaiman writes on the subject of myths, you can get from something very mundane to profane, and something very malignant to benign fairly easily as you play a sort of game of Telephone with cultures. I agree with Mark and always had my doubts that Protoceratops specifically was the griffin and like he puts it, always felt that the story connecting the two seemed too selective with evidence given the timeline and geography. But like Jaime said I also am not so quick to assume griffins and many other mythical creatures weren't based on fossils in some way somewhere down the line. We know there were many kinds of ceratopsians living in various parts of Asia. All it takes is one fragmentary specimen. What makes us think chimeric animals come from anywhere? Couldn't it just be that someone who had heard of birds of prey and big cats thought "hey, wouldn't it be cool if there were flying birdcats? In conceptualizing a mythological being, the ancients would have conflated creatures that represented the strengths and dangers of their world. A bird of prey would have been known and respected for its power of flight and ability to kill swiftly. Big cats, for their power and speed on land, and that same deadliness. There is no need for these creatures to be based on any fossilized materials, though knowledge of strange bones and teeth made of stone has probably been part of the collective unconscious since before we had spoken language. To understand the origin we just have to look at the purpose they served in culture. If they were meant to inspire fear and awe, as a warning to stay away from certain places, or narrative entertainments, or symbols of personal power... then the melding of characteristics from both known predatory species and legends of stranger things found in far-off places would serve that purpose readily. It's more likely, to me, that the concept arose organically from multiple disparate threads. I always felt that this was one of Mayor's weaker arguments, which is a shame considering how much popularity it gets. Good to see a longer critique of the idea. Additionally, while griffins may have become more popular in Greece during the 7th century BCE, they definitely have a much longer history there. For example, the palace Knossos on Crete has griffins dating from the bronze age. I echo Jaime's point about taxonomy and note that the most recent edition of "The First Fossil Hunters" also mention Psittacosaurus, so maybe we could take the argument as "non-neoceratopsians inspired the giffin myth". That being said, you make a persuasive argument Mark. However, while ceratopsians may not be the source of the griffin legend, might the Greeks have heard of the fossils and at least taken them as corroboration of a pre-existing myth? On other horned dinosaurs/any fossil animals still being somehow related to griffin lore: the issue is providing some robust evidence of this. Non-fossiliferous explanations of this creature already do a very adequate job on their own, so we need good reason to complement or overturn these existing interpretations with fossil-based reasoning. What might be best is some robust evidence that shows, beyond all doubt, that relevant fossils were directly involved with the right people at the right time. This might be in the form of very specific literary accounts (i.e. works more akin to Herodotus' attempts to rationalise the natural world than tragic poems featuring lots of fantastic elements) or evidence that certain cultures collected/traded relevant fossils. Without this sort of evidence (and it does exist in some cases - we know some Palaeolithic people collected and transported fossils long distance, for instance) we're just speculating. Chris: Anzu is not directly discussed in the literature on this hypothesis, but I think you're generally right that there is some 'lumping' of griffin types happening here. I like the explanation you presented of griffins as having started out as symbolic depictions of religious or cultural ideas. Maybe they were mixed up later with bits and pieces of literal discussions of animals people had seen. If someone from the 40th century dug up a Renaissance painting of an angel, perhaps they would think that somebody had found a fossil of a hominid with wings -- but of course that never really happened, and it is very unclear whether the painter himself really thought that there was literally a physical entity that looked like that. I like your reasoning and explanations, but I in fact do believe the griffin myth was based upon some fossil. However, unlike Protoceratops, I think the griffin anatomy fits more with Oviraptor, or other oviraptorosaurians, in combination with tyrannosaur or other theropod fossils. The large, bird like head, and bird like arms of oviraptorosaurians, and the muscled limbs and torso of theropods. I doubt the bones were well preserved enough for such people, with little knowledge about them, to accurately represent them to the extent of an identifiable griffin. The difference, for example, between tyrannosaur, dromeosaur and oviraptorosaurian anatomy could also account for the variation shown between different depictions. Your second image in the article is captioned as "perhaps the oldest known image of a griffin, from Susa, 4th *century* BCE"
From the text of your article,I gather that the oldest image is from the 4th Millenium? Indeed - thanks for the catch! Another relevant line of investigation is linguistic. 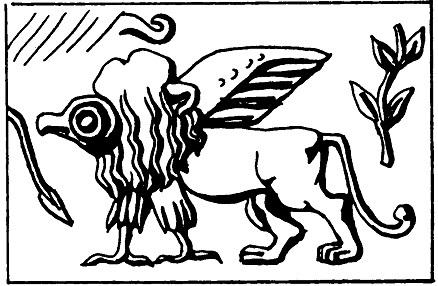 The Greek word Gryphon could be related to the Semitic name for various winged monster / chimera / guardian figures, related for example to the Biblical Cherub. Cherubim guarded the ark of the covenant. I am startled to learn about this Protoceratops-griffin hypothesis, as I had somehow never run across it before, despite my interests in paleontology and Bronze Age civilizations. Your arguments, Mark, all ring true to me and are very similar to my initial reactions after reading the first paragraph. A similar claim has been made that the one-eyed giant Cyclopes were based on the skulls of mammoths or other extinct elephants (the nasal opening being mistaken for an orbit). I've also come across claims that Chinese dragons and Sioux thunderbirds are based on various fossils. I think all these claims are rooted in an assumption that pre-modern peoples were somehow incapable of imagination. Not necessarily incapable of imagination. That would be the case if they were depicting literal images of what they saw, which they certainly weren't. Imagination, regardless how wild, is inspired by something. Linking myths with fossils is one of those 'catchy' ideas people love to buy into despite very little evidence, much like pop neuroscience linking brain areas with emotions or exagerrated claims about "exotic" cultures. There's one thing you haven't mentioned: the chances of an ancient culture uncovering a complete fossil, or even recognizable parts of it, are very slim in the first place. The earliest ancient fossils linked with actual myths were usually nothing more than teeth and vertebrae, and even those were ridiculously misinterpreted. The Chinese fossils interpreted as "dragon teeth" usually belonged to homo erectus. As an aside: in 1923 and 1939, Othenio Abel published two book about how remains of fossil animals found their way into folklore. Although particularly the second book is heavily influenced by the national socialist obsession with "Folk culture" (Abel was a staunch nazi by this time), it shows a critical attitude (Abel, Othenio (1939). Vorzeitliche Tierreste im deutschen Mythus, Brauchtum und Volksglauben. Jena: Gustav Fischer). He does not discuss a possible Protoceratops-griffin linke, but does lend some credence to the idea that the horns of frozen woolly rhinoceroces were taken for griffin claws (or claw sheaths). Outstanding and informative analysis of an interesting topic. Thanks!